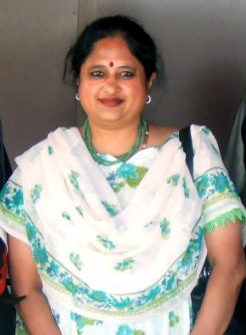 Indu Srinivasan is the author of “khatta meetha theeka” blog. She is an English literature graduate with psychology as a subsidiary major. She taught conversational English during her young days in India. She has been living in U.A.E for 30 years with her family. At present, she is a contented homemaker. Her loving, caring, and encouraging husband as well as her beautiful and sweet daughter motivated her to start this blog. The very title of her blog indicates that she isdedicating the blog to the three different spices and flavors of life. She believes we come across as sour (khatta) in our attitude, sweetness (meetha) in our gesture and anger (theeka) which makes us furious. Beside her cooking blog, her other interests including travelling to different countries, surfing the net, and experimenting with different dishes. [Indu] My cooking philosophy is to be original and innovative and experience a variety of flavors and aromas that result from my culinary experiments. [Indu] I trained myself right from the teens till date to cook Indian food. I prefer taste of Indian food rather than other cuisines. Indian food has diverse spices, color and aroma and flavor which are not seen elsewhere. This motivated me all the more to share my knowledge and learn some more from my blogger friends. [Indu] I hope that my fellow bloggers can try out the different recipes in my blog and share their experience with me. This will certainly motivate me to get creative with my own cooking. [Indu] I was interested in Indian food right from my teens. I have taken a lot of tips on various spices, pulses, and other ingredients from my mother, grandmother as well as later in my life from close friends. [Indu] I am interested in many blogs and websites that offer food recipes. I glance through them when time permits. [Indu] In the North Indian cuisine, my favorite is Alu palak or palak paneer and Bhindi masala served with rotis. In the south Indian cuisine, my favorite is Idly, Vada with Sambar and chutney. I make it a point to prepare these dishes when I invite friends and family over. My other dish that I would like to to improve on is Dal Makhni. [Food-india] What are other type of foods you like? [Indu] Once in a while I do not mind going in for Chinese vegetarian food or Italian vegetarian pizzas. [Indu] I would like to add that if you are interested in simple homemade South Indian Khana (Sappadu), http://kattameethatheeka.blogspot.com/ is just a mouse click away.